L’Hermitage offers the very best of beachfront luxury living in Fort Lauderdale. These two iconic 30-story towers come complete with all of the best high-end amenities and indoor features you’ve become accustomed to. With 444 total units in both towers, L’Hermitage offers floor plans from two to six bedrooms. Two bedroom models start at just $759k with 1,537 square footage of living space. Six-bedroom penthouse suites are available for $6.5M with 7,167 square feet of living space. Located at 3100 Ocean Boulevard, L’Hermitage is right in the middle of the action and offers beautiful views of the Atlantic Ocean, the canals of the Intercostal Waterway, and downtown Fort Lauderdale. When it comes to beachfront luxury living, L’Hermitage gives you the best opportunity to experience all that Fort Lauderdale has to offer. Step into your beautiful Fort Lauderdale condo through an expansive double door entryway and nine-foot ceilings. Floor-to-ceiling glass windows and sliding doors let in plenty of natural light and provide beautiful panoramic views. Every unit at L’Hermitage comes with an expansive wraparound terrace and plenty of outdoor living space; some models even include summer kitchens and outdoor jacuzzis. High-efficiency air conditioning and heating systems provide comfort in every area of the house. Kitchens feature European-style cabinetry custom designed for L’Hermitage, so your kitchen will be unique to Fort Lauderdale and South Florida. A built-in pantry, granite countertops, and ceramic tile floors house your top-of-the-line General Electric appliances. Master bathrooms include a glass-enclosed marble showers, a luxurious Roman tub, and custom marble vanities. The two towers of L’Hermitage are also home to plenty of community space and amenities, not to mention the 600 linear feet of beachfront. Two lagoon style swimming pools are nestled along the beach adjacent to a poolside deck and cafe’. Private beachfront cabanas are available where you can relax or host guests in the barbecue area. If you’re a fan of sport, L’Hermitage has its very own tennis center and viewing area as well as a state-of-the-art health and fitness spa. Impress your guests in The Orchid Room, a beautifully designed bar, lounge, and kitchen area. Play your hand in the card room, or watch the game on the big screen TV in the sports and billiards room. L’Hermitage even has an area to walk your furry friends separate from outdoor living spaces. L’Hermitage is walking distance from dozens of dining, entertainment, nightlife, and cultural venues. If you’re a fan of the links, Coral Ridge Country Club is just a short distance away as well. Close proximity to Route 1 and I-95 gives you easy access to all of the action in Miami and South Florida. 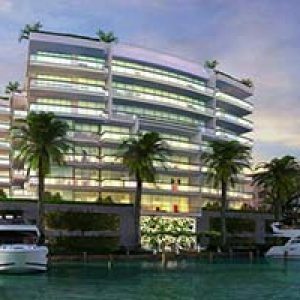 L’Hermitage is truly an iconic Fort Lauderdale luxury living experience, find out why by purchasing your very own luxury condominium!